Hello again! Our family took a little vacation to Colorado to camp in the mountains and we’ve recently returned…with Rocky Mountain dirt and all! In all honestly, it was the one of the most beautiful and fulfilling getaways we’ve had together as a family and I cannot wait to share it all with you. Camping with babies can be hard, but the beauty in that challenge far surpasses any blunder or mishap. But onto a really wonderful (and simple) recipe you can make in less time than it takes to brew coffee if wanting a last minute kiddo activity or if the weather isn’t cooperating and you’re stuck indoors. 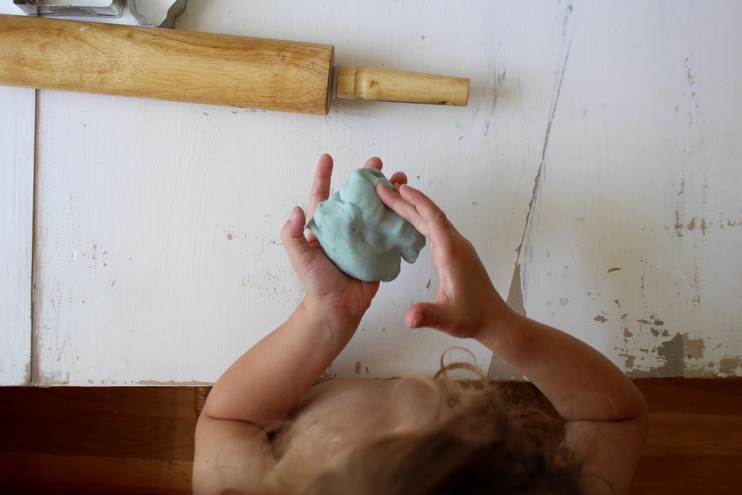 We stopped buying play dough years ago because I found out how simple it is to make. Yet again, one of those things many people buy in stores and don’t ever think to whip up at home. The beauty in this is that you can make this in ten minutes. And I happen to think anyone with kids of their own or those with nieces/nephews should have this in their arsenal, because what kid (or adult?) doesn’t love play dough? Ever since we started using essential oils I always add a few drops to increase the kids’ sensory experience. They really love it and as do! Our favorite oils to incorporate into this recipe are soothing ones like lavender, bergamot and frankincense. As their little hands roll and cut and mold, the oil diffuses into the air making their playtime more calming. Adding the essential oil also promotes a more holistic learning experience as this activity engages multiple senses. Note: This particular recipe keeps for much longer if you use cream of tartar so I suggest adding it if you happen to have it in your pantry. If not, it will keep for a week or so. Also, I added some dried lavender buds from our garden to the final product but that step is completely optional. I do, however, recommend adding essential oils. To prepare, combine water, oil, salt, cream of tartar, and food coloring in a saucepan. Heat until warm, making sure not to boil. Once warmed, remove from heat and mix in the flour. Stir and then knead with your hands until the dough is smooth. 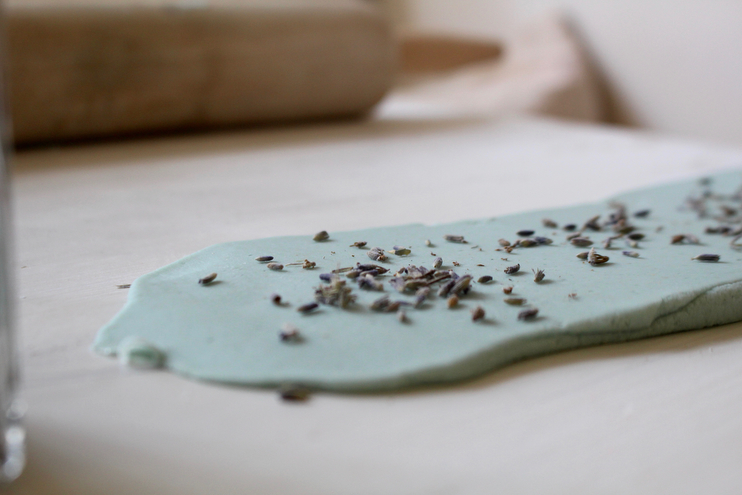 Roll out flat on the counter and add the essential oils to surface of the play dough. Knead the dough once more until everything is well incorporated. 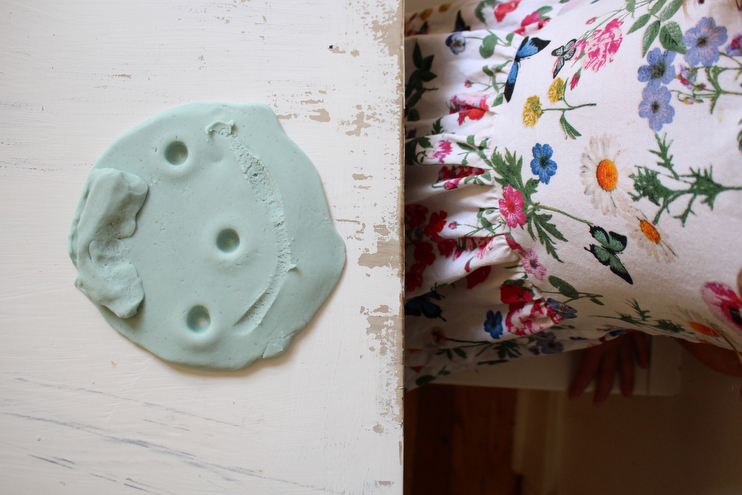 Store your play dough in an airtight container such as a Weck or Mason jar.